Hadex S.A. respects the privacy of all users. Data from booking and/or contact forms. To improve certain functions of our website (www.nadmorski.pl), we have implemented a booking and contact forms where some personal data must be given, such as name, e-mail address, telephone number or data necessary for invoicing purposes. Data submission is voluntary, but necessary to book a room or contact us via the website. Providing data is voluntary subject to your consent and only for the above purposes. Please, note that you do not need to submit the data if you do not want to take advantage the above services. Data collected during our marketing activities. 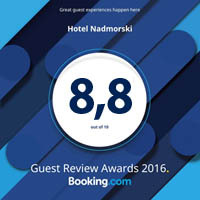 If you subscribe to a newsletter, your e-mail address will be stored in our database for marketing purposes to promote the services of the Nadmorski Hotel **** in Gdynia. You may withdraw your consent for storing your e-mail address any time. When you visit our website, information about your visit, such as your network request, IP address, platform type and web browser type, Internet supplier and the address of a site from which you entered the website, is collected automatically. Hadex S.A. processes user personal data in accordance with the applicable regulations. We do not sell or provide any data to third parties. Information given by you may be made available to competent public authorities on the basis of the applicable legal regulations. The data collected from booking forms will be used only to book rooms online. The data collected from your correspondence on our website will be used only to respond to your inquiries. If you subscribe to or otherwise agree to receive our newsletter, we will use your e-mail address only to send an e-mail containing information about our services. The data collected automatically may be used to analyse user behaviours in our website, gather demographic information about users or personalise the content of our websites. The data of each user is collected automatically. It is not combined with your personal data. If you book our services online, you will receive an e-mail confirming your reservation. We may also contact you by phone if we have any important information about your booking. If you subscribe to or otherwise agree to receive our newsletter, you will receive information about the current offers of the Nadmorski Hotel**** in Gdynia. How may you inform us about data changes? By phone, e-mail, mail or via our contact form. The data collected automatically may be neither changed nor deleted. A company collecting the data: "HADEX" Spółka Akcyjna with its registered office in Gdynia, registered with the District Court for Gdańsk-Północ in Gdańsk, 8th Commercial Division of the National Court Register under the number 0000098882; NIP (VAT No.) 586-001-12-53. Address: 81-409 Gdynia, ul. Ejsmonda 2. If you have any questions concerning privacy protection, please contact us by e-mail or via the contact form available under CONTACT.